In The Search for a Relational Home, Chris Jaenicke gives the reader an inside view of what actually happens in psychotherapy and how change occurs. He describes how both participants – the patient and the therapist – feel, and how they affect each other. The reader is encouraged to vicariously partake in the process from the perspective of his or her own life experiences. The book describes the nature of therapeutic action through a radicalized version of intersubjective systems theory. It demonstrates how psychotherapy is an outcome of a highly personal encounter between two unique human beings, and how, while the goal of psychoanalysis is to help the patient, this can only be achieved inasmuch as both participants are willing to undergo transformation. Jaenicke clarifies how both successes and failures as well as personal strengths and weaknesses play a constitutive part in the psychotherapeutic process. The Search for a Relational Home also provides theoretical and practical guidelines for supervision. Jaenicke presents here a unique approach to the process of psychotherapy which will be vital reading for psychoanalysts, psychotherapists and those in training as well as students in all fields of mental health. 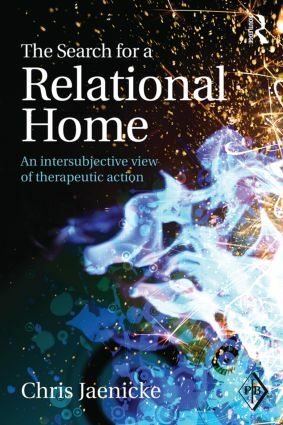 "The Search for a Relational Home: An Intersubjective View of Therapeutic Action is a book aimed at showing how an understanding of the patient-analyst dyad as a complex dynamic system deepens our grasp of the therapeutic process and therapeutic change. What is unique about the book is its emphasis on the critical importance of failure, both the patient’s and analyst’s, in furthering the therapeutic process. In his inimitable evocative and reader-friendly language, and with characteristic openness about his own emotional experiences, Jaenicke shows how the strengths and weaknesses, limitations, and sufferings of both participants become entangled and worked through. Punctuated with rich clinical illustrations, the book offers much wisdom to seasoned practitioners and trainees alike." – Robert D. Stolorow, PhD, author, World, Affectivity, Trauma: Heidegger and Post-Cartesian Psychoanalysis (Routledge, 2011). Acknowledgments. Basic Premises: Thoughts on Success, Failure and Cure in Psychoanalysis. Rafaela: A Case Description. Ending Treatment: Rafaela Redux. The Shadow Man: A Case Description. Supervision from an Intersubjective Perspective. Epilogue. References. Index. Chris Jaenicke is a faculty member and training and supervising analyst at the Arbeitsgemeinschaft für Psychoanalyse und Psychotherapie, e.V. Berlin. He is in private practice in Berlin, Germany, and is the author of several previous books, including Change in Psychoanalysis (Routledge, 2011). Like its counterpart, Psychoanalytic Inquiry: A Topical Journal for Mental Health Professionals, the Psychoanalytic Inquiry Book Series presents a diversity of subjects within a diversity of approaches to those subjects. Under the editorship of Joseph Lichtenberg, in collaboration with Melvin Bornstein and the editorial board of Psychoanalytic Inquiry, the volumes in this series strike a balance between research, theory, and clinical application. We are honored to have published the works of various innovators in psychoanalysis, such as Lachmann, Fosshage, Stolorow, Orange, Sander, Wurmser, Grotstein, Jones, Brothers, Busch, and Lichtenberg, among others. The series includes books and monographs on mainline psychoanalytic topics, such as sexuality, narcissism, trauma, homosexuality, jealousy, envy, and varied aspects of analytic process and technique. In our efforts to broaden the field of analytic interest, the series has incorporated and embraced innovative discoveries in infant research, self psychology, intersubjectivity, motivational systems, affects as process, responses to cancer, borderline states, contextualism, postmodernism, attachment research and theory, medication, and mentalization. As further investigations in psychoanalysis come to fruition, we seek to present them in readable, easily comprehensible writing. After 25 years, the core vision of this series remains the investigation, analysis and discussion of developments on the cutting edge of the psychoanalytic field, inspired by a boundless spirit of inquiry.